Sanders campaign just beat record held by President Barack Obama in 2011 in his bid for re-election. 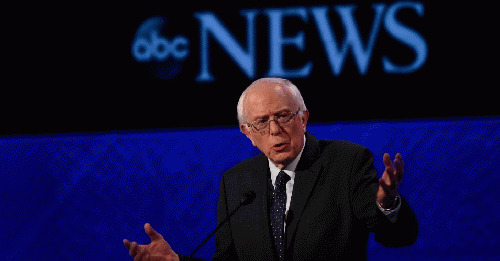 The Bernie Sanders campaign announced Sunday that it "reached a major milestone in grassroots financial support" during the third Democratic presidential debate. A statement posted on its website says the campaign has now received over 2.3 million contributions. That means Sanders now holds the record for highest number of contributions for a White House bid, breaking the record held by President Barack Obama in 2011. The statement adds that "grassroots supporters flooded" the campaign site during the debate, with the average contribution amount being below $25. Last week, when his campaign surpassed the 2 million contribution mark, the Vermont senator praised the "People Power" supporting his campaign, saying, "You can't level the playing field with Wall Street banks and billionaires by taking their money." The campaign also claimed victory for "winning social media" during the debate against his rivals, former Secretary of State Hillary Clinton and former Gov. Martin O'Malley of Maryland. While climate change wasn't mentioned, as one Huffington Post reporter points out, the debate moderators did make time to ask the candidates what role their spouses would play in the White House. "The DNC needs to schedule more debates on more nights when more Americans are watching. "That's good for Democrats. And that's good for democracy -- especially in what is shaping up as an entirely unpredictable and frequently volatile political season that ought not be dominated by one party. As Lis Smith says, 'It's clear we need to open up the process, have more debates, and engage more voters in this process.'"